Do you need an child or adult size patriotic costume for President Day? You can shop for a wide selection of kid, men, and women patriotic costumes of historical figures from American history. You can dress up as one of the many great US figures such as George Washington, Abraham Lincoln, Benjamin Franklin, Betsy Ross, and more. Dressing up as one of the legendary former US presidents or a famous American historical person is perfect for book reports, theatrical plays, and reenactment events. Are you feeling patriotic this election season, or do you just want to make fun of the latest popular political figure for Halloween? We have an assortment of full size masks of today's and yesterday's most popular (or notorious) Republican and Democratic politicians like George Bush, Barack Obama, Joe Biden, Michelle Obama, John McCain, Sarah Palin, Arnold Schwarzenegger, Hillary Clinton and other famous public figures. Shopping for Halloween masks can be very confusing if one is unsure with what to buy. With Political masks a lot of factors come into play. 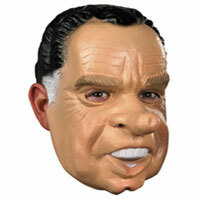 You can find a popular political masks at Halloween stores. Halloween face disguises can be fun as long as they are comfortable. The masks come in different styles and types such as some are front masks that cover just the face while others are full size latex masks that fit over the head. 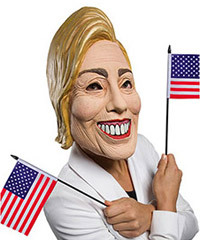 This years most popular political masks are of course Barack Obama and Hillary Clinton face masks.